New Flyers goalie Mike McKenna has been on eight NHL rosters and 11 rosters in the AHL. The Flyers, undergoing their worst season in 12 years, can use all the laughs they can get these days. Enter Mike McKenna, 35, who is part backup goalie, part standup comic. Plucked off the waiver wire Friday by the Flyers, McKenna is on his eighth NHL roster, including three teams in three days last week. He has also been on 11 AHL rosters and, so, yes, you have to develop a sense of humor — and a true love for the game — to keep the inner fires burning. 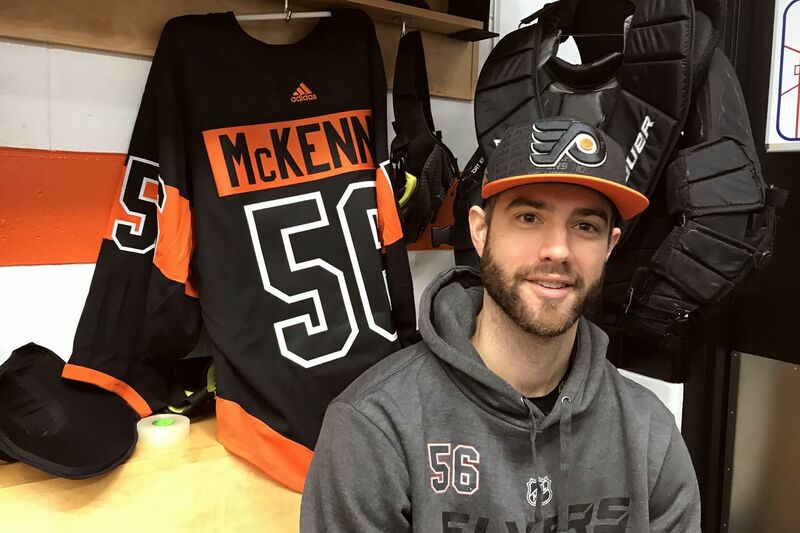 McKenna may get the call Tuesday in Washington, or he may have to wait before he becomes the seventh goalie to play for the Flyers this season, tying an NHL record. He is patient. When you were drafted 17 years ago (Nashville, sixth round) but have played in only 34 career NHL games, you tend to go with the flow. McKenna talked about the time he was in the AHL with Norfolk and the team bus was sideswiped by a Volvo and was disabled for hours, or another time when Portland’s team bus blew a tire, caught on fire, and made the news. McKenna has had only one full practice with the Flyers and hasn’t developed much familiarity with his defense, but he said he was ready. McKenna’s wife and two young daughters are living in Ontario. McKenna knows he could be packing, again when Michal Neuvirth or Brian Elliott return from injuries. Wayne Simmonds entered Monday needing one goal to reach 200 with the Flyers. ... Claude Giroux (60. 5 percent), Jordan Weal (59.5 percent), and Scott Laughton (59.1 percent) were ranked Nos. 1-2-3 in the NHL in faceoff percentage before Monday.